As part of its 2018 Kitchen Trends Study, Houzz recently surveyed more than 1,700 U.S. homeowners in various stages of a kitchen renovation project. 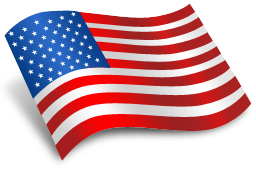 Their answers offer a look into what is currently popular in American kitchens. Among many other things, the study asked homeowners about which kitchen layout they chose for their remodel. Half of the homeowners surveyed changed or planned to change their kitchen layout during the renovation. Of those, 35 percent chose an L-shaped layout, making that the most popular option. 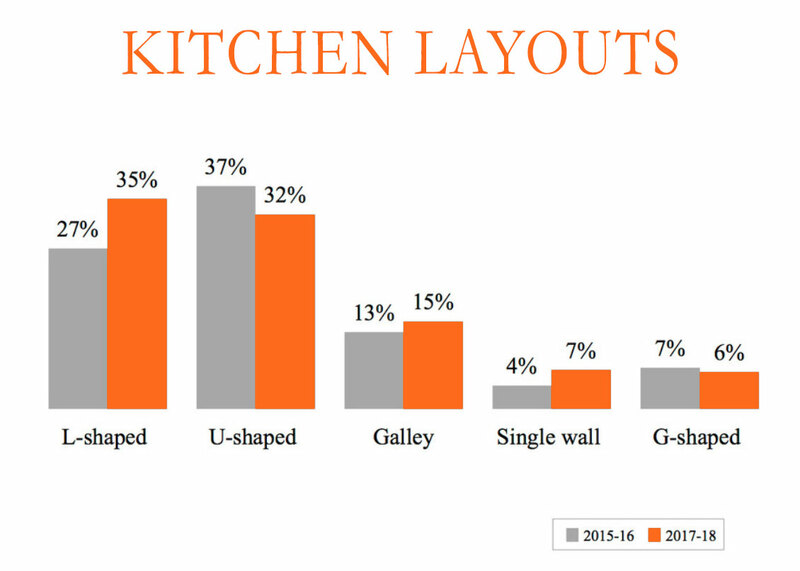 Shown in the graph above, this is a shift as two years ago U-shaped was most popular among renovating homeowners who changed their kitchen layouts. 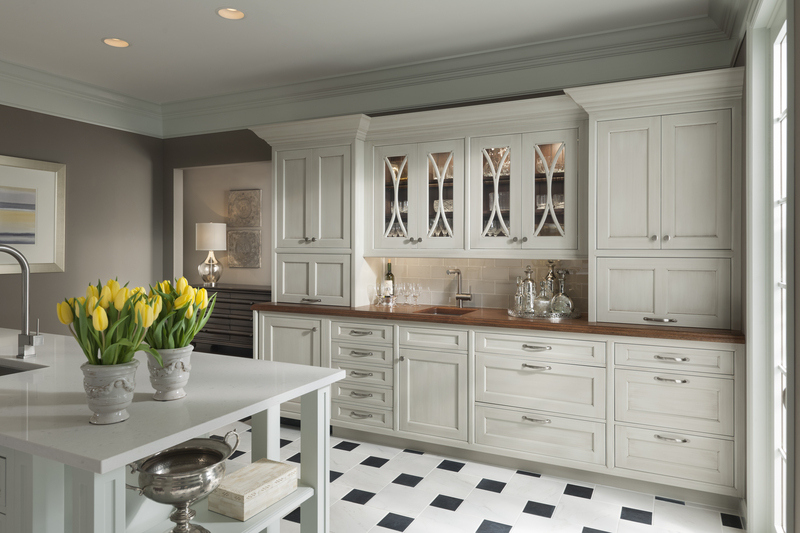 This L-shaped kitchen was designed by Stonington Cabinetry & Designs. 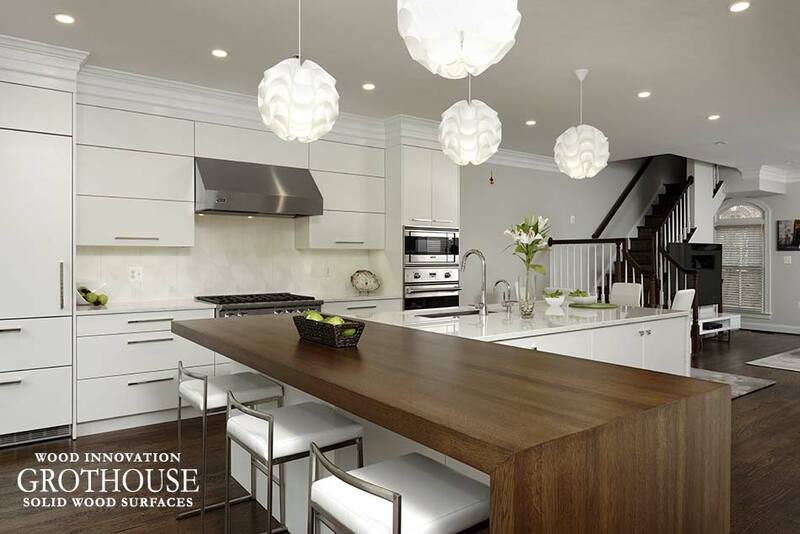 Featuring white cabinetry and a Grothouse Walnut wood kitchen island countertop. Design by J.S. Brown & Co.
Brandon Okone and Monica Miller, MCR, UDCP, CMKBD of J.S. Brown & Co. designed this gray transitional L-shaped kitchen with an American Beech kitchen island countertop. 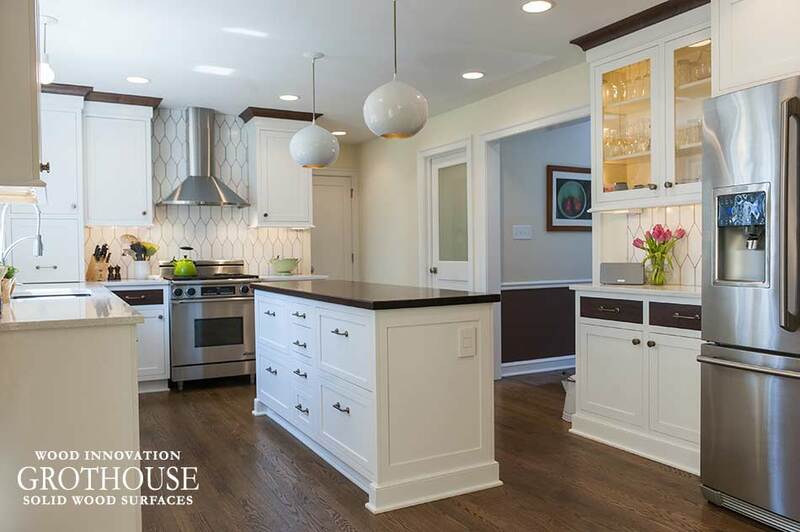 Diana Burton of Drury Design Kitchen & Bath Studio designed this traditional white L-shaped kitchen with a Sapele Mahogany countertop for the kitchen island. View the Countertop Image Library in the Countertop Design Guide on our website to see more designs with an L-shaped kitchen layout. 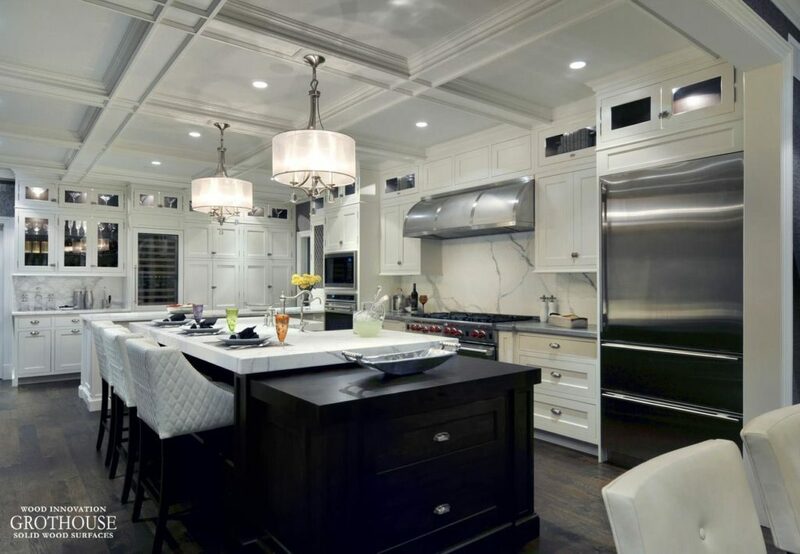 White kitchen designs have stood the test of time in beauty and popularity. However, reluctance to embrace a kitchen with white walls and cabinets is common due to the fear that the space will feel too cold. 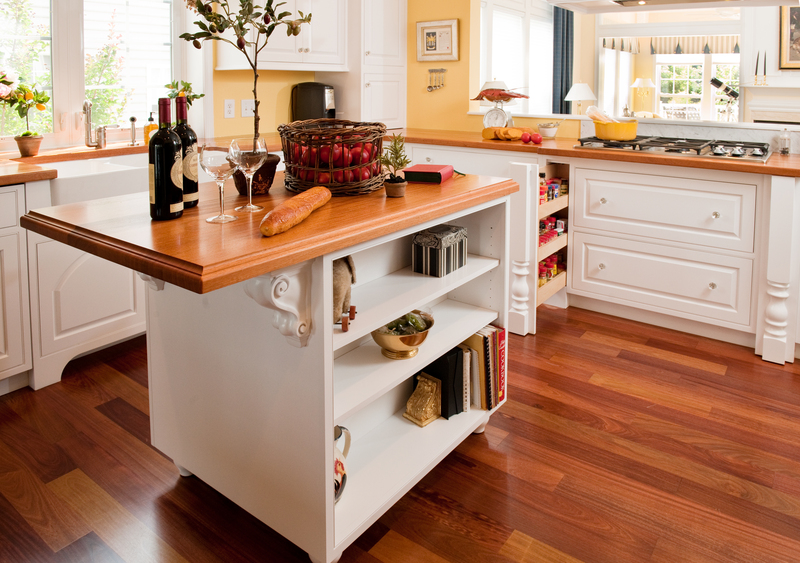 Wood countertops are a great way to create balance by adding warmth and texture into an otherwise all-white kitchen. 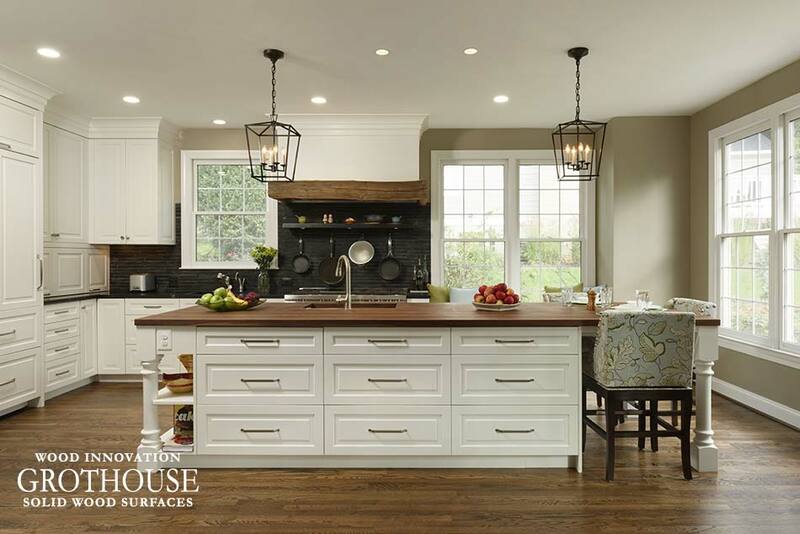 Starting with this transitional white kitchen design by Stonington Cabinetry & Designs, a Walnut wood countertop matches dark wood flooring. The wood brings warmth, while white cabinets and perimeter countertops keep things bright. Pine Street Carpenters, Inc. designed this contemporary white kitchen to feature a Peruvian Walnut kitchen island countertop. Matching drawer fronts and cabinet mouldings tie in the dark wood floors and countertop. A Peruvian Walnut kitchen bar top complements the dark wood floors and provides contrast to this mostly white traditional kitchen. This design by Luxe Kitchens and Interiors was also featured on homebunch.com for interior design ideas. Paul Bentham of Jennifer Gilmer Kitchen & Bath designed this contemporary white kitchen to feature a large White Oak parsons table. 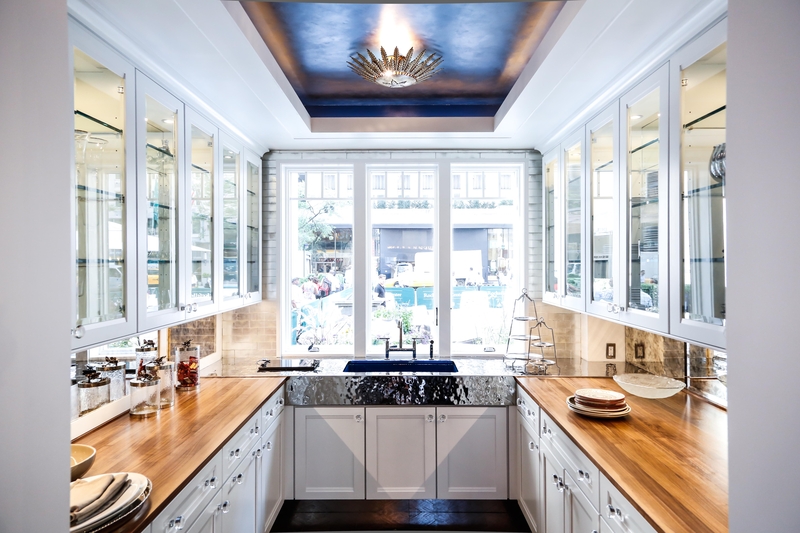 This kitchen won Second Place Large Kitchen in the NKBA Baltimore/Washington Chapter Design Contest in 2016! 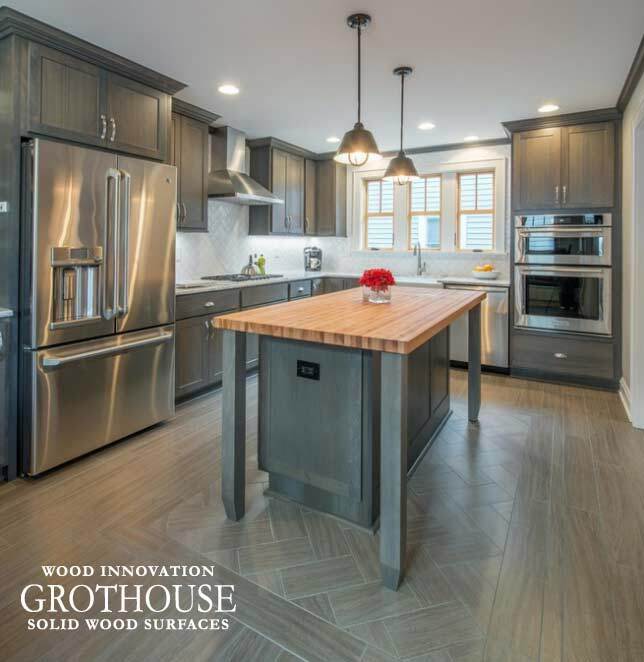 Visit the Grothouse Photo Gallery to view more white kitchen designs with wood countertops. 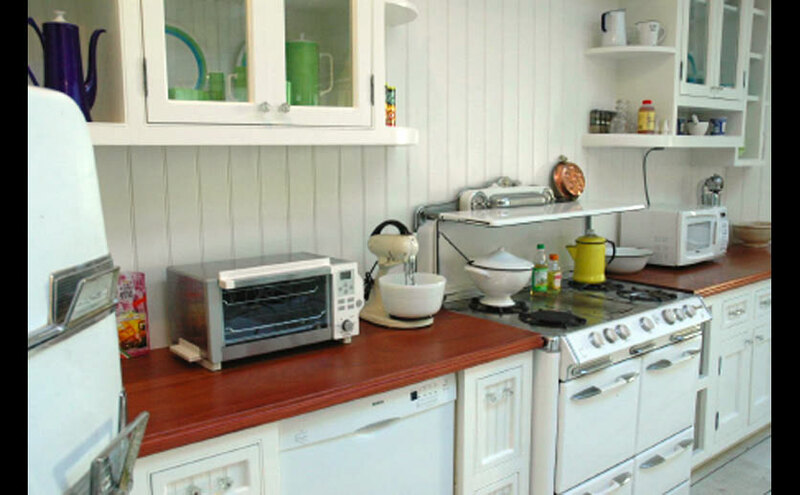 White Kitchens and wooden surfaces have stood the test of time. The timeless appeal of this combination creates a space that can be enjoyed for a lifetime. White kitchens have been the most popular for over 20 years and continue to be the most commonly installed cabinet color. But did you know there are over 1,000 shades of white to choose from? This blog post highlights some of our favorites of white kitchens. In 2007, this kitchen served as a backdrop for a skit on the television show Saturday Night Live. The countertops are crafted of Sapele Mahogany wood and sealed in our Durata® Waterproof Permanent Finish. 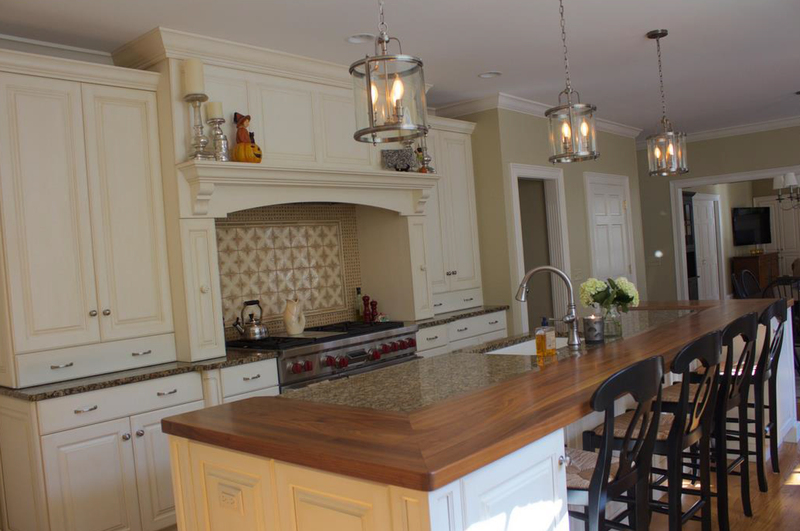 White Cabinets and African Mahogany Wood Tops. Photography by Jim Graham. 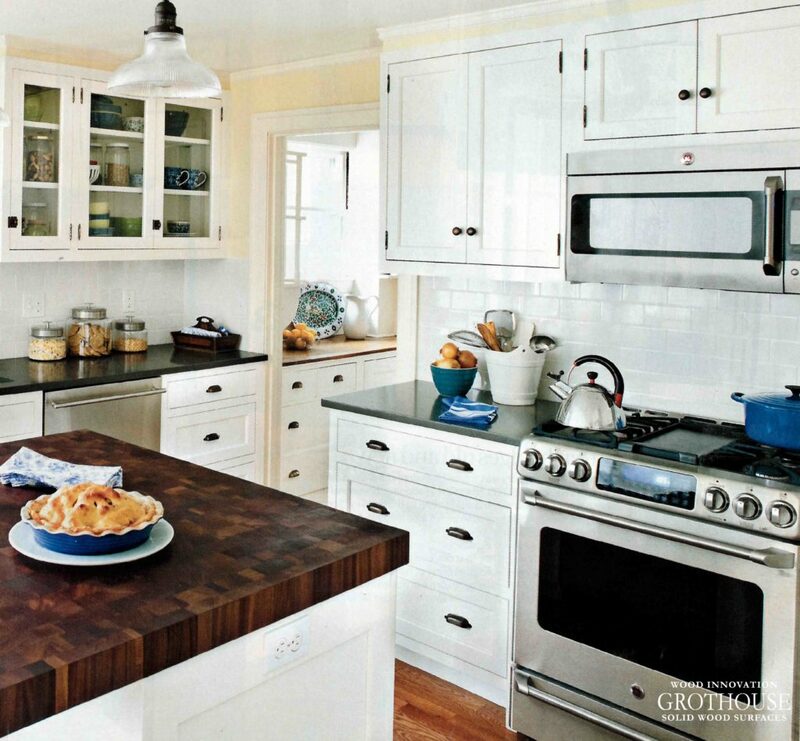 In 2009, Waterbury Kitchens designed this kitchen to include white cabinets and African Mahogany Wood Countertops. In 2012, Mick De Giulio designed this space for House Beautiful Magazine’s Kitchen of the Year. 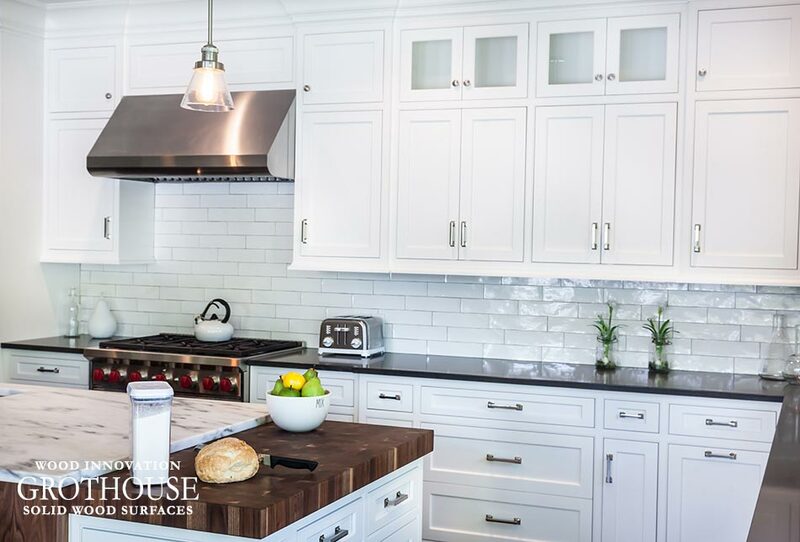 The white cabinetry is paired with two Walnut Wood Countertops sealed with our Durata® Waterproof Permanent Finish in Satin sheen. In 2013, Auer Kitchens designed this white kitchen to include a Walnut Wood Countertop sealed with Durata® Waterproof Permanent Finish in Matte sheen. 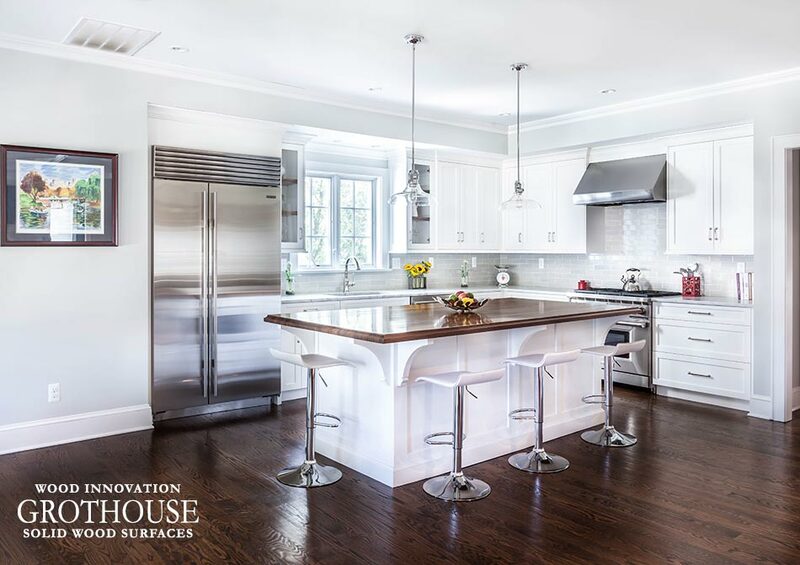 In 2014, Wood-Mode, Inc. incorporated a distressed Sapele Mahogany Wood Countertop into the bar area of this white kitchen. 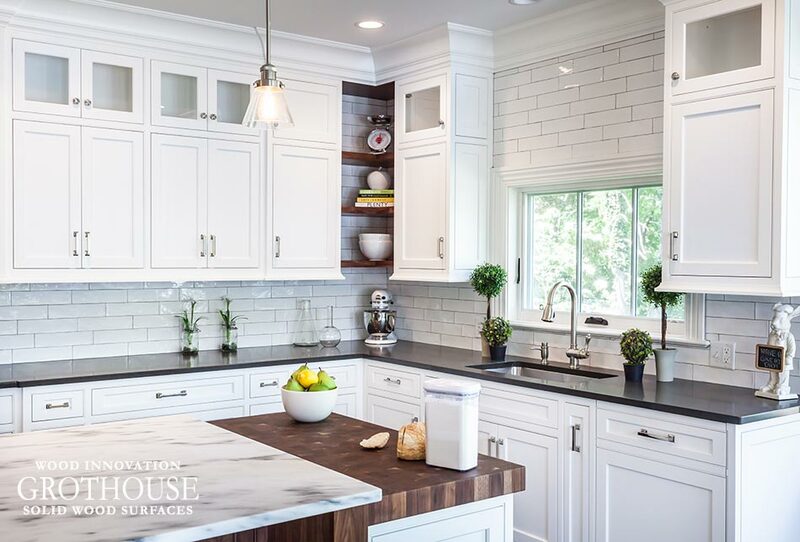 In 2015, Sarah Kahn Turner of Jennifer Gilmer Kitchen and Bath designed this white kitchen with a large Walnut Wood Countertop for the kitchen island. 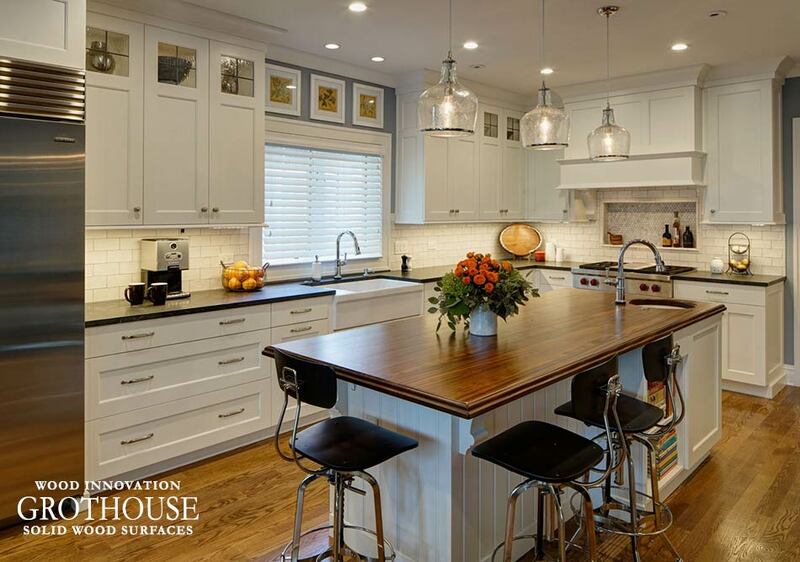 To see more designs of White Kitchens and Wood Countertops, visit our Houzz profile.